It's not easy defining what courage, gallantry, bravery or selflessness actually is, and yet we constantly have a need to do so. I suppose by praising incredible actions taken by often very ordinary people during extraordinary times, we're perhaps holding up some kind of mirror to ourselves and, in doing so, glimpsing what potentially we all could be. Although this may seem like a bit of a reflective ramble, it was triggered by a story appearing in the papers today, and featured on national radio and TV, concerning the actions of Scots soldier William Angus who a century ago was awarded the Victoria Cross (VC), Britain's highest award for gallantry. Before the start of the First World War, Lance-Corporal Angus was a miner turned professional footballer, having spent time with Glasgow's world-famous Celtic Football Club. And because he was also a member of the local territorial battalion of the Highland Light Infantry (HLI), he was immediately mobilised when war broke out in 1914. In the early part of 1915, Lance-Corporal Angus and his HLI comrades were transferred to the 8th Royal Scots, to bring the regiment up to strength after it had suffered heavy casualties. 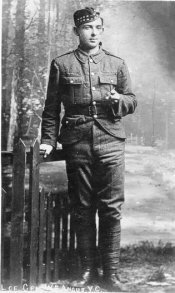 On June 12, at Givenchy-lès-la-Bassée near the Franco-Belgium border, Lance-Corporal Angus volunteered to venture out from the safety of the trenches into no-man's land to save wounded comrade Lieutenant James Martin. The two also came from the same Lanarkshire town, Carluke. What happened next was simply incredible because Lieutenant Martin was lying within yards of the German trenches. The enemy knew he was there, too, and tried their hardest to finish him off. Fortunately for Lieutenant Martin, they couldn't stick their heads above the parapet because of the steady stream of rifle fire being directed at the trench. So they lobbed grenades at him instead. The entry in The London Gazette announcing the award of the Victoria Cross says, "No. 7709 Lance-Corporal William Angus, 8th (Lanark) Battalion, The Highland Light Infantry (Territorial Force). For most conspicuous bravery and devotion to duty at Givenchy on the 12th June, 1915, in voluntarily leaving his trench, under very heavy bomb and rifle fire, and rescuing a wounded officer who was lying within a few yards of the enemy's position. "Lance-Corporal Angus had no chance whatever in escaping the enemy's fire when undertaking this very gallant action, and in effecting the rescue he sustained about 40 wounds from bombs, some of them being very serious." One of those serious wounds included the losing of his left eye. And yet after spending only two months in hospital, Lance-Corporal Angus was able to travel to Buckingham Palace in London where he received his medal from King George V.
Lieutenant Martin and Lance-Corporal Angus both went on to live long lives. Every year, on the anniversary of the rescue, Lieutenant Martin always sent a message of thanks to Lance-Corporal Angus. When Lieutenant Martin died in 1956, the Martin family continued the tradition until the death of Lance-Corporal Angus in 1959. Now, there were many acts of extreme courage and bravery during the First World War. Indeed, more than 600 VCs were awarded in total, all of them highly deserved. But to me, what makes the award to Lance-Corporal Angus stand out is the fact he volunteered to save his fellow comrade. This was not done in the heat of battle, when the blood is up and any act is likely to be more instinctive than anything else. No, he deliberately chose to put himself in harm's way, to venture out beyond the safety of the British trenches into no man's land, picking his way some 70 yards under heavy fire, dodging bullets and bombs and suffering dozens of wounds. Yet he never turned back. An incredible story of courage which certainly makes you think. Placed in a similar position, I ask myself what would I have done? The honest answer is I don't know. Perhaps, in reality, holding up the mirror is in truth a pointless exercise.